Develop a loving relationship with God revealed through Jesus and the wonders of God’s creation. Develop a sense of belonging to a Catholic community with knowledge of the life, faith, tradition and mission of the Catholic Church. Promote principles and skills to reflect, discern, critically think and decide how to actively live as a committed Christian in the wider community. Nurture a realisation and appreciation for the diversity and value of each individual and a respect for different cultural traditions and religions. Develop a capacity to support the faith of the individual, families and community with a sense of peace, harmony and compassion. 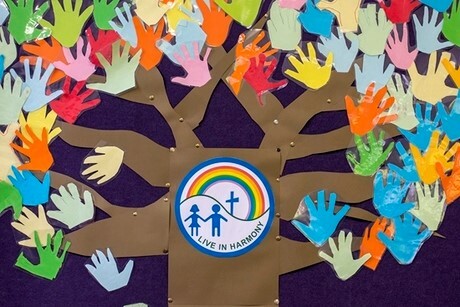 Religious Education is an essential and valued area of learning which develops students’ religious literacy in the light of the Catholic tradition, so that they develop as people, learners, community members and contributors to society.